On my last birthday, I officially crossed over to the high side of middle age. Yes, I have joined the ranks of older horsewomen. Personally, I’d like to popularize the term “vintage horsewomen” because it connotes a certain amount of charm and respect. Yet regardless of the terminology, I’d equate getting older to a wedge of high-priced gourmet cheese: There’s much to be treasured about the aging process, but first you have to get past the part that stinks. I’ll start with the way riding clothes don’t fit me the way they once did. I used to look like a runway model flaunting the real-life version of equestrian couture. But sometime during my 40s, that began to change. While my weight has remained pretty consistent, the pounds aren’t distributed equally. My body fat has turned on me like a herd of horses that no longer want to graze on the prime meadowlands. Instead, it’s headed for the hills of my hips. She’s not kidding. Though I’ve yet to develop the much-maligned muffin top, I have acquired what I refer to as “biscuit bunches.” These are soft pads of tissue that have glommed on to my upper thighs, mocking my desire to wear full-seat breeches as part of my everyday wardrobe. I once thought nothing of running errands in horse clothes. Now, if time permits, I change out of anything made with spandex and faux suede before heading to the grocery store. I don’t want to offend fellow shoppers with a rear-view image of me. As it is, after a riding lesson I shuffle up and down the store aisles like a zombie. I lean against the handle of the grocery cart like it’s a walker. Besides coming to terms with my changing curves and flagging energy, age has also forced me to re-examine my goals as a rider. For a while I continued to envision a 30-something version of myself. The self-image I held on to was free of chronic health problems, equine-inflicted battle scars and the aches of tired joints. The process of bidding farewell to my high-octane glory days on the show circuit was difficult. I literally went into mourning. Yet once I got past that sense of melancholy, I became comfortable with who I am now as a horsewoman. I’m at home on the back of a well-trained, predictable gelding. This has zero to do with fear and more to do with a slower reaction time, brittle bones and a desire to stay out of the ER. 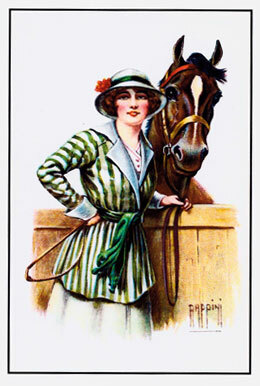 Fortunately, there are benefits to wearing the mantle of Vintage Horsewoman. When I sift through stacks of old photos, I’m amazed at all the horses I have raised, ridden or shown. Each one taught me something. I can thank Bubbles, for instance, for teaching me the meaning of that adage: “Never jump ahead of your horse.” A devious stopper, Bubbles would slide into a jump if I happened to roll my shoulders forward in anticipation of leaving the ground. A mare named Lady taught me to use my aids only when necessary. She demanded a quiet rider with finesse; she wouldn’t tolerate being nitpicked to death. Other horses helped me learn lessons about life. When I met Jazz, he was 17.2 hands with a nasty attitude. He had a cheap price tag because, despite his talents, he was a sullen beast no one could trust in the show-ring or in the stall. But with consistent, fair discipline and unrelenting affection, he became a dependable mount and an honorable champion. Jazz exemplified the notion that love, when applied appropriately, does indeed heal all wounds. I hope this isn’t interpreted as a lack of humility, but we live in a society that discounts the value of anyone much past their 30s. Yet in the horse world, years of experience practicing sound horsemanship skills are priceless. Thus I’ve come to embrace my age. It’s actually a worthy accomplishment to grow older with my boots on. If you happen to be a vintage horsewoman, I encourage you to be proud of your years in the saddle too. Own your history on horseback. Give your knowledge value by sharing it. Teach novices how to avoid the mistakes that you surely made many years ago. Offer basic lessons in riding and safe horse-handling to beginners, or mentor a Pony Club or 4-H group. Consider working part-time at a training barn. Trust me, professionals appreciate an assistant who already knows how to properly boot up and longe a horse. Want to be more altruistic? Look for a therapeutic riding program in your area and volunteer a few hours a week as a side-walker. You can also search for a reputable horse rescue facility that needs someone dependable who can work with abused and neglected horses. Ultimately, I hope that as you grow older you’ll find your own place on this long, glorious trail ride of life. Just don’t retreat. Don’t become invisible in the horse community. Wear your wrinkles, your scuffed-up boots and your ill-fitting riding pants proudly. Be patient with novice riders and offer your wisdom when appropriate. It’s your choice. You can become a wise mentor and local resource, or simply be disregarded as just another crazy old horse lady. My biggest problem as I have aged is loss of balance which makes me feel very insecure in my english saddle. I now have a light-weight western saddle which helps a little. I’m hoping some senior yoga classes will help with my balance a little. Susan is right. Balance does become a problem. I’ve switched to a Western saddle as well. And oh, the brittle bones! I’ve broken a number of them over the past few years with just the slightest of mishaps. But here’s another idea. We have a huge park where I ride alone much of the time, so I’ve now signed up with the County Sheriff’s office as a member of their Mounted Volunteer Unit. Now when I ride around the park, I’m on duty and making good use of my time as another set of eyes for the police who can’t patrol all the areas all the time. I’m sure many areas have programs such as this one. Oh boy, something to look forward too! With all the injuries I’ve accumulated over the years I’m not sure the vintage years are going to treat me very well. I now have a dead broke quarter cross gelding who is bomb proof. I feel much more confident on him now that I have accepted the fact that my reflexes are slower and I like being pain-free 😉 My previous horse has a perfect new home with riders who match his energy level. I also grieved the changes with getting older and now I am at peace with them. I look forward to many more years as an “easy rider”! For those used to English style riding but wanting to feel more secure (and very comfortable!) try an Australian Stock Saddle. I train dressage on my Spanish Andalusians in my Wintec Pro Stock saddle as it puts me in the correct seat but it’s like having a seatbelt for safety. Yes,even though I have reached 60 I still love riding and hope to do so for many years to come. I don’t bounce like I use to either,but at least the falls I have had I have gently slipped off the horse laughing as I came off. As a lifelong horse lover, with no opportunity to learn to ride, I began learning at age 60 (now 66). I ride a Rocky Mountain walking horse, a lesson horse with a nice easy gait and a gentle disposition. I don’t expect to become a great rider, but I’m learning a lot and having a lot of fun learning with and from my horse.